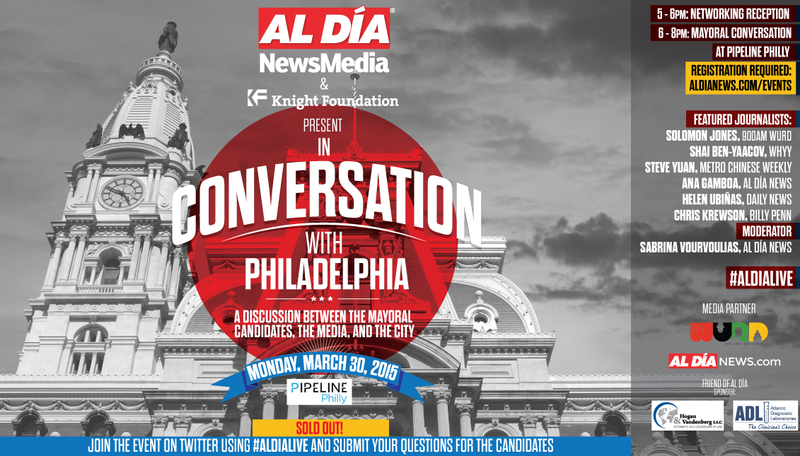 AL DÍA News Media hosts a unique conversation leading up to the 2015 Philadelphia Mayoral Race! This conversation will break the wall between the candidates, the media, and the public. The mayoral candidates will converse with a selection of the city’s leading journalists in front of a diverse audience. The candidates will receive questions primarily from the journalists, but also from the audience, who will submit questions for the candidates via Twitter during the event. This event will highlight the lack of representation for diverse communities in Philadelphia, touching upon the disconnect between City Hall and the public. If you’re a Philadelphian, join our audience and participate in this one-of-a-kind opportunity to let your voice be heard in front of our city’s next mayor. This event will take place at Pipeline Philly, a multi-purpose open workspace, located across the street from City Hall. A networking reception will take place from 5-6pm. Fruits, cheeses, wine and beer will be served. The conversation will begin at 6pm. Dynamic discussion, networking possibilities, City Hall, and the candidates: Become part of the evening that will help shape the 2015 Philadelphia mayoral race! Moderated by AL DÍA News’ Managing Editor. Keep up-to-date with the latest developments in the Mayoral Race here. AL DÍA News Media’s print product is nationally award winning and has a 96% market penetration. In 2014, the company relaunched its website with a focus on national content generation.